Elseworlds Part One review: Freaky Friday brings heroes together – AiPT! Elseworlds Part One brings heroes together with the introduction of a major DC villain and a new hero in the fight against evil. 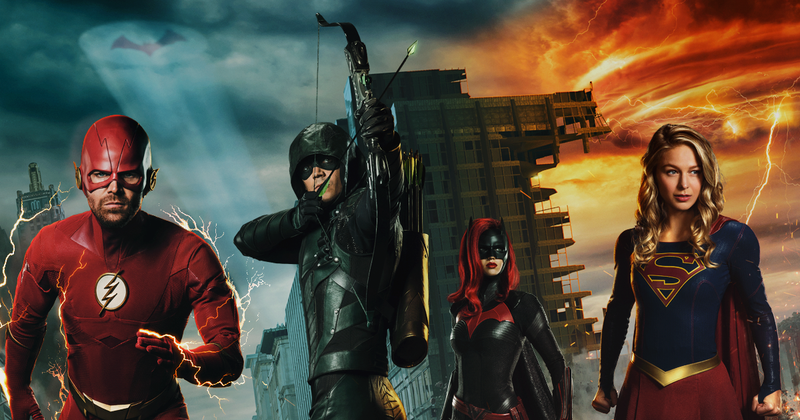 Sunday night, the CW brought its now-annual superhero crossover to television in its three-night event, Elseworlds, beginning with The Flash, and continuing on Tuesday with Arrow and concluding on Wednesday with Supergirl. In the first part, we were quickly introduced to the main plot line, our big bad villains, and the fact that Sherloque Holmes’ third ex-wife lives on Earth-38. Let’s team up! After a quick cold-open where a sleazy-looking professor gives a lecture about eugenics to several people who swiftly walk out and then meets a guy with mutton chops and a glowing book, Oliver Queen wakes up in Barry Allen’s bed. And his life. Everyone thinks he’s Barry Allen, complete with photographic evidence and the fact that Oliver now has the powers of The Flash. He might not know how to use them yet, but that’s why he needs to head to Star City. It’s there that Barry Allen finds himself sparring with John Diggle at ARGUS and shooting arrows expertly at some random baddies. The Freaky-Friday switch of powers and lives seems super cool to Barry until he realizes it means that Iris is now married to and in love with Oliver. That’ll get the new Arrow moving. The only person they can think of that could convince the team that they truly are who they say they are is, of course, Kara. She, and her cousin, head to Earth-1 to help smack around a powers-copying robot (AMAZO!!) that Oliver/Flash accidentally mega-juiced. Monster-of-the-week aside, this episode served as the initial set-up for the whole event. We see Mutton-Chops (aka The Monitor) and how he observes Sisco vibing, we know that whatever Monitor is doing is happening in Gotham city, and we know that Kara is sticking around to help. The fact that the CW has reordered the shows this week tells us something as well, I believe. The Flash is an upbeat show, great for Act One. Arrow, of course, is generally the downer, so it gets Act Two. Supergirl is the most hopeful of them, which works for Act Three. Another thing that telegraphs this well is the necessity of Oliver and Barry to both act like the other in order to access their powers/abilities. Oliver channels his anger into his arrows while Barry runs and lets his joy lead the way. From that we get some great impressions of “Green Arrow” and “The Flash” from Barry and Oliver and a real insight into each character. Questions remain, however. Like, why just these two swapping places? Why did we only get a few minutes of the joy that is Lois Lane? Will Alex Danvers meet Kate Kane and finally find a new hero to crush on? What is The Monitor after? Biggest moment of the night: Hearing the old Smallville theme when we flip to Earth-38 as Kara hides out in the small town after Supergirl’s firing from the DEO. Honorable Mention: Diggle heroically puking after being dashed away from a robbery by Oilver/Flash. Crisis on Infinite Earths announced for 2019 on CW!